Google has now signed enough renewables deals to match all of its energy needs this year, though not all the projects are currently operational. The company has agreed to buy 2,397 megawatts of clean power in the U.S. — and 3,186 megawatts overall, according to Bloomberg New Energy Finance. Amazon.com Inc is the second biggest corporate buyer, with 1,219 megawatts, all in the U.S. Read more here. Photo: The Block Island Wind Farm in the waters off Block Island, Rhode Island. Big Blue to install big solar in Boulder, PV Magazine. IBM has announced plans to install the largest PV system in Boulder, Colorado, which will also be the largest system on IBM property, as the city continues to move toward municipalizing its electricity system. We Energies to shut Pleasant Prairie coal plant, increase renewables, Utility Dive. According to the Sierra Club, it is the 266th coal-fired power plant in the United States to close down. WEC Energies expected to replace coal plant with 350 MW of solar, PV Magazine. The company will close the 1,200 MW Pleasant Prairie coal plant early next year, on the heels of its plan to install 350 MW of solar by 2020. Electric Co-ops Dedicate 60-Acre Solar Farm, LEX18. Members of the 16 electric cooperatives that make up Kentucky’s Touchstone Energy Cooperatives can participate by licensing solar panels. For a one-time payment of $460 per panel, participating members will receive a 25-year license and they will get credit on their monthly power bills for the value of the energy generated by their share of the solar farm. Cooperative Solar Farm One features 32,300 solar panels capable of producing up to 8.5 megawatts of electricity, enough to provide all the power needs for approximately 1,000 typical homes. 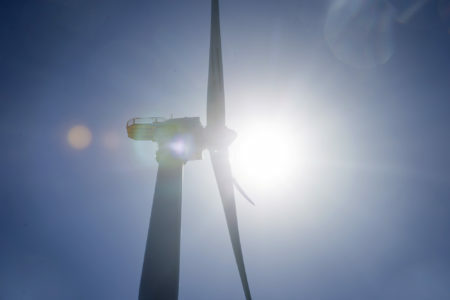 AWA launches statewide campaign showing benefits of wind, Windpower Engineering Development. American Wind Action (AWA) launched a statewide campaign in Iowa to engage the public and encourage, as well as support efforts to protect its 9,000 local jobs and contribution to the local economy. AWA will air a series of TV, print, radio, and digital ads in a variety of Iowa media markets throughout the remainder of the year. New York becomes the fourth state to add energy storage mandate, PV Magazine. Following the lead of Utah, Oregon and Massachusetts, the New York Public Service Commission has been charged with creating the targets by January 1. GTM Research identifies five new countries poised to install more than a gigawatt of solar annually, Greentech Media Research. When this year comes to a close, GTM Research expects eight countries will top the 1-gigawatt mark in annual PV installations. By the end of 2018, that number will grow to 13 countries. According to GTM Research’s latest Global Solar Demand Monitor the next five countries to cross the 1-gigawatt annual threshold will be Brazil, Egypt, Mexico, the Netherlands and Spain. 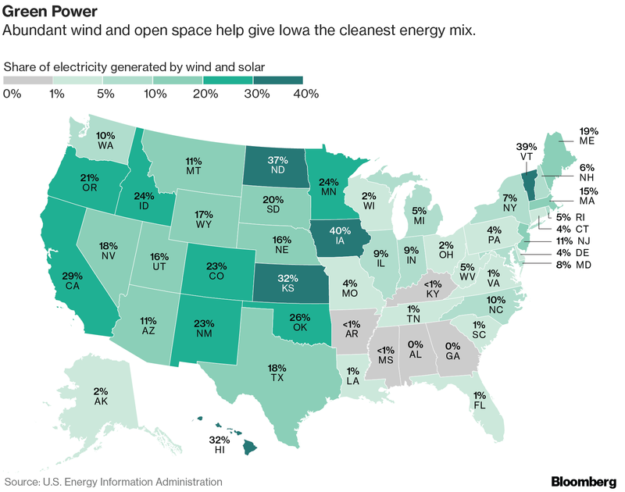 California Is Plenty Green But Iowa Has the Cleanest Power, Bloomberg News. Aggressive environmental polices under Governor Jerry Brown have given rise to vast wind and solar farms, allowing California to generate almost one-third of its electricity from renewable sources. Meanwhile, Iowa has one of the nation’s least ambitious clean-energy targets and gets as much as 40 percent of its power from wind and solar farms. This entry was posted in NewsBlog and tagged 100% renewable-powered cities and towns, corporate buyers of renewable energy, global energy storage news, global renewable energy news, Nebraskans for Solar, renewable energy research, U.S. energy storage news, U.S. renewable energy news on December 1, 2017 by Helen Deffenbacher.